1 Ware, Richard, ‘The case of Antonio Rivero and sovereignty over the Falkland Islands’, Historical Journal, XXVII, 4 (1984), 961–7. 2 House of commons foreign affairs committee, session 1983–84, fifth report and minutes of proceedings, Falkland Islands. 6 Parish to Aberdeen, 15 Mar. 1829. P[ublic] R[ecord] O[ffice, London], F[oreign] O[ffice papers], 6/499, fos. 1–3. 7 Barrow to Hay, 2 June 1829, ibid. C[olonial] O[ffice papers], 78/1, fo. 65. Dunglas to king's advocate, 9 July 1829, F.O. 83/2227, fos. 95–9. Aberdeen to Parish, 8 Aug. 1829, F.O. 118/22, fos. 78–80. 8 Parish to Aberdeen, 26 June 1829, F.O. 6/499, fos. 17–18. 9 Parish to Aberdeen, 25 Apr. 1829, F.O. 6/499, fos. 4–16. 10 Aberdeen to Parish, 8 Aug. 1829, F.O. 118/22, fo. 79. 11 Aberdeen to Parish, 17 Sep. 1829, F.O. 118/22, fos. 86–9. 12 Parish to Aberdeen, 5 Dec. 1829, F.O. 6/499, fos. 31–40. 13 Duncan to Hood, 4 Feb. 1832, F.O. 115/59, fos. 186–7. 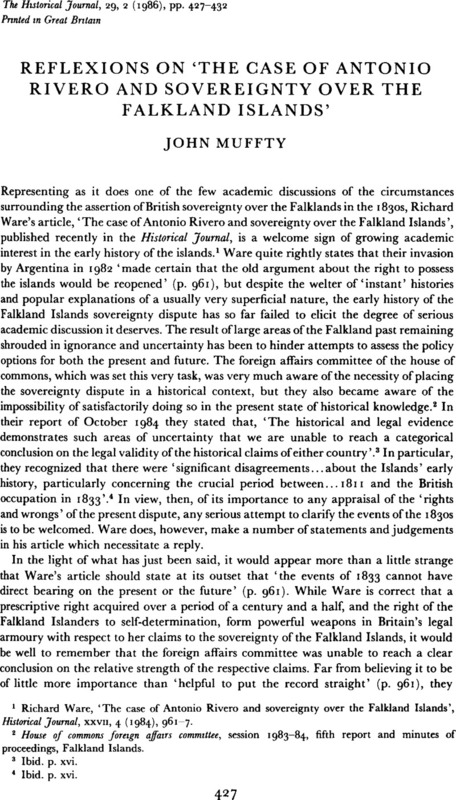 14 Goebel, J., The struggle for the Falkland Islands (New Haven and London, 1982 edn), p. 455. 15 Ibid. p. 468. Fox to Palmerston, 15 Oct. 1832, P.R.O., F.O. 6/499, fos. 180–99. Palmerston to Lords of the Admiralty, 30 Aug. 1832, F.O. 6/499, fos. 170–1. 16 Elliot to Shee, 31 Aug. 1832, F.O. 6/499, fos. 172–3. 17 Home Office memorandum, 2 June 1835, P.R.O., H[ome] O[ffice papers], 48/30, case 5. 19 Palmerston to Bankhead, 21 June 1832, F.O. 115/59, fos. 178–9. 20 Baker to Onslow, 28 Nov. 1832, F.O. 6/500, fos. 96–100. 21 Hay to Elliot, 5 Aug. 1834, C.O. 78/1, fos. 92–4. 22 Onslow to Gore, F.O. 6/500, fos. 116–24. 23 Home Office memorandum, 2 June 1835, H.O. 48/30, case 5, p. 22.